As you can tell, it looked like winter. My understanding is that things have not gotten significantly better since then. So, around midnight, as I’m reaching my front door, I look down, and decide I must be hallucinating. Because I think I’m seeing narcissus blooming. I get up the next day, trying to make sense out of what I saw, and truly, spring has somehow happened while I was away. 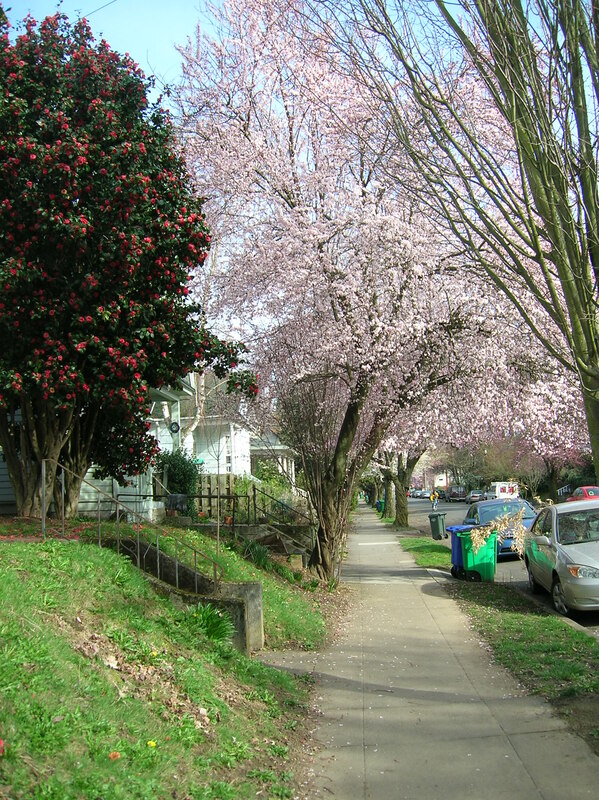 And I wander a bit around the neighborhood, finding yet more flowers, including the cherries and the camellias. All of this seems a bit early to me, but I’ve got to say, I love spring in Portland. Here in Portland, we’re seeing the first signs of spring. On my walk to work earlier this week I brought along my camera, and took a few pictures as I went. 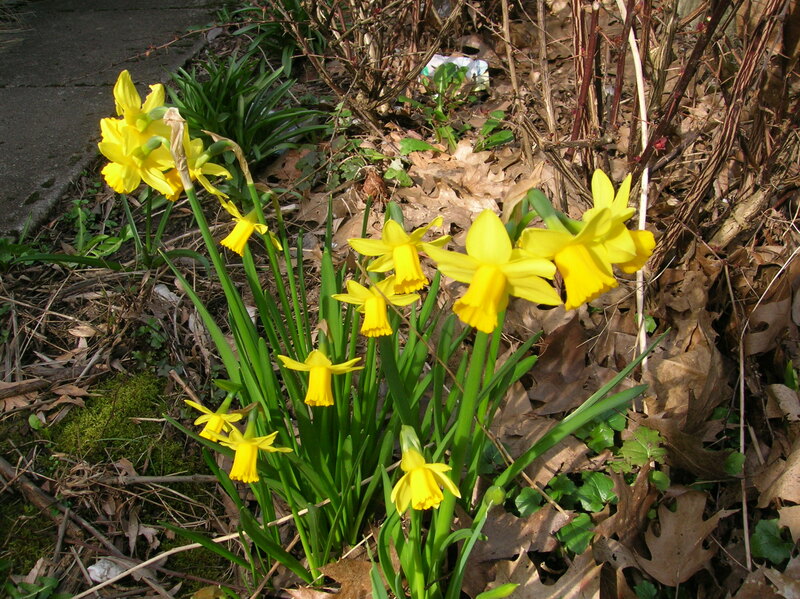 First, right outside our home: Narcissus. 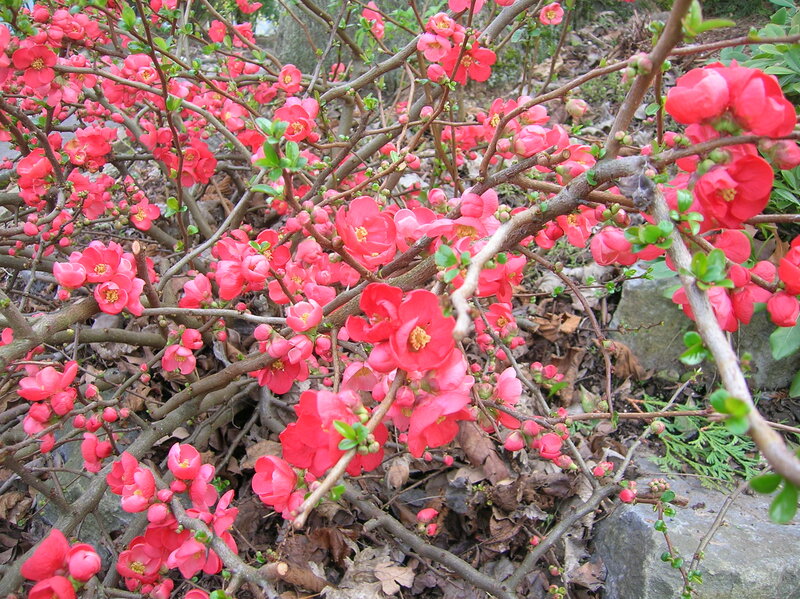 I don’t think I’ve noticed this being the first flowers of the spring before, but this year, it beat out the forsythia. As I was walking to work, I definitely saw crocuses. Many crocuses. Purple ones , yellow ones. Purple and Yellow ones. I only got pictures of a few, but you’ll have to take my word for it, there are many crocuses all over. 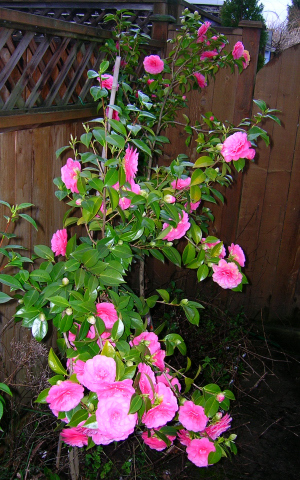 I’ve also seen some camelias, which is interesting in that I think of them as a much earlier flower. Nonetheless, there they wwere in full bloom. Then there were the flowers I didn’t recognize. The wild yellow flowers that seemed sort of muppety: Kind of cool, aren’t they? This is the time of year when I love walking to work, because I get to see the flowers move along day by day. Each day there are new flowers getting ready to bloom, or trees getting ready to leaf out, or various other changes of state happening all around us. So I’ll keep walking with my camera, and hopefully continue to share photos with you. 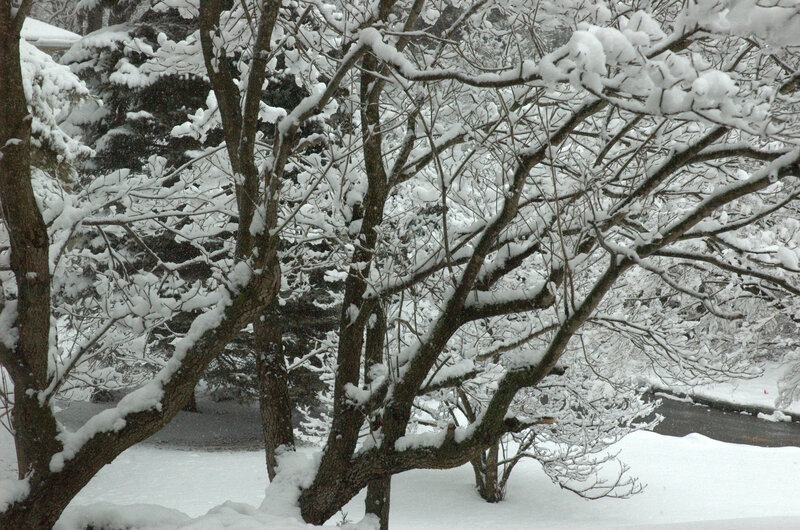 I know the calendar says it is June 12, but for the last week it’s really felt more like winter than late spring. People have been walking into CubeSpace bundled up in fleece and hats. It’s been wet. And while this recent week has been extreme, it’s not like it’s been isolated. We really haven’t had much of that beautiful spring/summer weather we cherish so much in Oregon. There was that brief period of two or three days when the temperatures sky-rocketed up into the upper 90s (which was either in April or very early May), but it was such a fluke that it didn’t register as summer (especially because it went back to low 60s and rainy immediately thereafter). I see the endless waiting wearing on people. There is little of the late spring joy one so often sees in people hereabouts this year. Instead, there is a mopey-ness. A sense of waiting for the other shoe to drop. A sense that the universe has it in for us. Nonetheless, I believe that summer will come. This mood will lift. Then, we will all be excited and play outside. In the meantime, we’ll all just have another cup of hot tea, and hope that we’re finally approaching summer weather. I’ve been thinking about the length of days in a lot of contexts recently. Whether it’s the length of daylight, the amount I can get done in a day, or the number of days allotted us before death, I seem to be encountering the issues. I was driving home from Salem on Friday night last week, watching the last light disappear from the sky. It finally became dark enough that I couldn’t really tell that the sky was at all illumined by the sun at 10:10 PM. I came out of CubeSpace yesterday after closing, at 9:05 PM, and it was still really light. I haven’t opened CubeSpace in the dark in over a month. There is just tons more light in the day than there used to be. Yay, Light! Somehow, the longer days aren’t resulting in me being able to achieve radically more. The number of hours in a day, and more importantly, the number of hours in a days when I can work effectively, seems to be about the same. Which is frustrating. I am getting a little more knitting done (I just finished the second sock of a pair that I’ve made for myself–pictures to follow), but in terms of real work, not as much is getting done as I would really like. So I’m going to try to step up the pace a little over the course of June, because over July and August, I suspect it will be more difficult to get work done, what with people being on vacation and all. Finally, I’ve been doing a lot of funeral-type work this week. A funeral yesterday, memorial prayers tomorrow. Death has this way of focusing one on what really matters. Is it the day-to-day, or the big picture issues that matter more. Does it really matter if I get that phone call made, or should I spend a little more time with family? Unfortunately, in the longer-term, making the phone call may enable more time to be spent with family. Somehow, the simple comparisons never are. I am increasingly aware of the fact that I am again. I was keeping track of a baseball game via the internet the other day, and I realized that the only player on the field who was my age or older was one of the pitcher…and that he was a knuckleballer (you can throw a knuckleball into your 50s–it’s a pitch that takes much more skill than athletic strength or stamina). Yet one more marker of my aging. Yet as I age, I also feel myself becoming more competent and comfortable in who I am. My body may not be what it was when I was 25, but I’m happier with who I am. I really wanted to do a “spring” blog post with the help of some photos, and have been putting off doing it for the last week because I was convinced I would remember to grab the camera from the office and take some photos. However, that has not happened, and a “spring is here” post can wait no longer. When the crocuses bloomed, I could wait, and not yet write about spring. When the daffodils came up, I was able to restrain myself. The camellias didn’t even really count as a sign of spring, because, really, they’re a late winter flower. 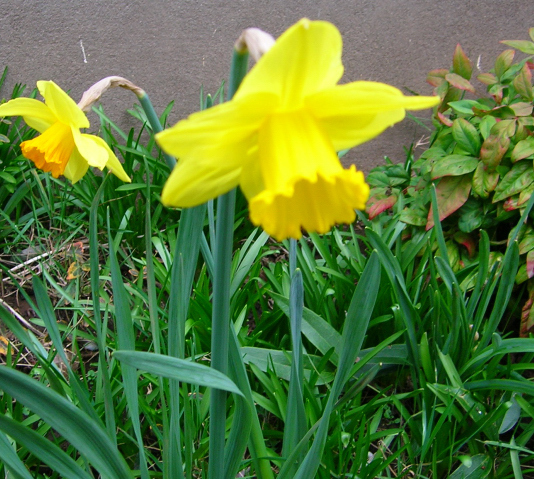 The daffodils blooming in the yard yesterday did not quite (but came very close) to requiring a spring posting. Today, however, I saw something which required a spring posting. 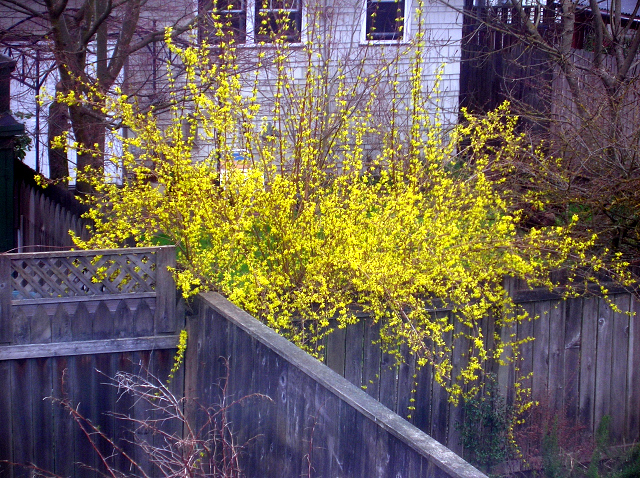 The neighbor’s forsythia is beginning to flower. Eva claims I am unnaturally attached to forsythia, and makes the further claim that my attachment is on account of the name “forsythia”. I want to make clear, that my attachment to forsythia may or may not be unnatural, but I believe has very little to do with the name (which it took me years to learn how to spell). What I love about forsythia is the profusion of yellow flowers coming so early in the spring. This is not the crocus, where each plant puts forth a single bloom, or the daffodil or narcissus, where each plant might put out three blooms. It’s not even the camellia where there may be quite a lot of blooms per plant. No, forsythia goes all out and the branches become nothing more than a vehicle for flowers, as the entire leggy branches of the bush become covered from ground to the tip of the branch with bright yellow flowers. Forsythia has an exuberance of flowering which goes beyond the other early flowering plants. When it flowers, it becomes nothing more than a giant collection of flowers. It is glorious and bright. And for me, it is the symbol that spring has indisputably arrived.